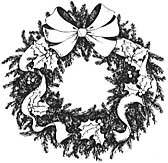 Wreaths on clamp rings are much easier to make and the quality is just as good, if not better than hand-tied wreaths. All different sizes available. Call for prices.